Gubernatorial hopeful Eliot Cutler and campaign staffer Annie Tselikis spent the day on the island talking to fishermen and small business owners about the challenges they face. “If we don’t start, we are never going to get there,” said Independent gubernatorial candidate Eliot Cutler as he addressed a group of fishermen at Stonington’s Harbor Café. “There,” he explained, is about creating a path toward prosperity and growing the Maine economy in ways that ensure people work. The rest, he said—the tourism and other parts that make Maine, Maine—will follow naturally once the economy is on solid footing. Cutler spent the day in the towns of Deer Isle and Stonington on Friday, February 21, meeting local business owners, passing out campaign materials and sitting for an interview with Penobscot Bay Press. “The state of Maine should look younger, it should look different because people will have enough money to take care of their homes and buy new boats; people will have the ability to spend more time with their families because they will not have to work two jobs. That is how it will look different,” said Cutler. The state gets there by investing in “our competitive advantages and the things that we are good at,” he said, as well as infrastructure and the creation of a capital budget. Highlighting “what Maine has to offer, building and sustaining fundamental industries, such as fishing, and branding the products created in the state,” is one way to strengthen the local economy and encourage continued tourism, Cutler said. 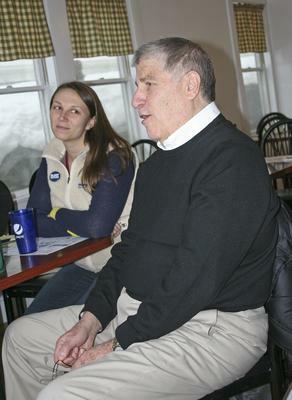 “Don’t spit in the other person’s eye; it doesn’t lead to constructive engagement,” said Cutler, who in 2011 created the non-partisan OneMaine as a way to support politicians willing to work across the aisle to solve problems. Cutler said that many legislators “go to Augusta to make things better, but often find that they don’t have the leadership from the Blaine House to bring people together.” All too often the politicians in Augusta have an attitude of “not in my term of office” when approaching long-term solutions. He feels there should be a holistic view of Maine and its interrelationships. “I have done a lot of things that have been successful by bringing people together; those leadership skills have made me successful,” said Cutler, recounting a near-decade-long project to bring six cities and one county together to build a new airport outside of Denver, Colorado. “And I did projects like this all over the country for 30 years, and it will be these same set of skills—leadership and collaboration with intent and purpose,” that Cutler says would follow him to Augusta. When asked what Legislative Document (commonly known as an LD) Cutler would consider putting his political capital behind, he responded with: “An Act to Make Maine’s Tax Structure More Equitable, Fair and Efficient,” as a suitable title for his first piece of legislation. With a focus on “dramatically reducing the property tax burden and making the tax structure more fair and efficient,” Cutler said he believes the current structure is an “irresponsible way to govern,” and said his first objective would be to fix it.